One of the most visually intriguing interior spaces in the city is the sanctuary of the Cathedral Basilica. The floor plan is reminiscent of European cathedrals and its stone walls are built up high. There are few windows so the atmosphere is subdued and the overall lighting level is low. A blue rose window by Tiffany and Company is placed over the entry doors and a vast dome is centered high above the great space that is filled with mosaic covered arches, walls, lunettes and columns. On either side of the Baldacchino that covers the high altar are two smaller richly detailed chapels with barrel vaulted ceilings. Each is filled with marble sculptures and elaborate mosaic work. 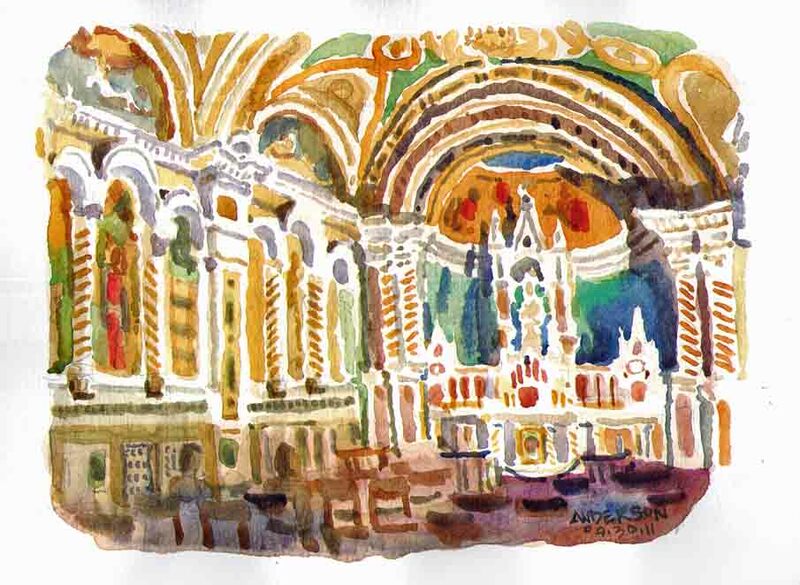 This sketch was done in Our Ladys Chapel during a Meetup with the St. Louis Drawing and Painting group. The Cathedral Basilica website features an excellent virtual tour of this remarkable and inspiring place. Our Ladys Chapel, 09/30/2011, Michael Anderson, waterbrush, watercolor on Canson 140lb cold pressed; 7″ x 9″. I love how you handled all the detail! All in mosaic tile. Thanks for your comment Marcia!